Last Friday, before we rushed out the door for work, Sean washed out the incubator and sanitized it. Ryan and I took a couple of minutes to set some eggs. We had collected 34 eggs over the previous week from the various coops. Our intent of hatching more "true-to-breed" chicks rather than "barnyard beauties" necessitated our collecting the eggs over more days than our usual procedure. 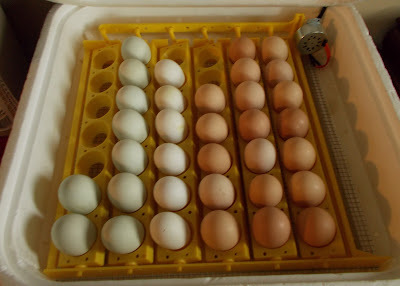 In the end, we compiled 9 Americauna eggs (the blue ones on the left), 6 Cochin eggs (white ones in the middle), and rounded our the incubator with 19 mixed breed eggs. With anticipation, I candled the eggs for the first time today. At least half were showing some indication of life, but it is still early days yet. 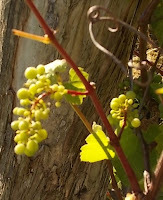 I will candle them again on Friday to see how many are truly developing. The chicks' genders are so far, undetermined. I have yet to hear any crowing or seen any spurs, but as yet, I have not collected any eggs from these either. Of course, either of those possibilities are much future signs. For the now, we have been graced with 43 chickens. Of these, 19 are most probably still laying, 4 are definitely NOT laying (as they are roosters) and up to 20 more will come on-line to lay this fall- depending on how many of THOSE are roosters. You know I am praying for hens! These should tentatively hatch on or around August 11th. Am I ready for this again? I guess, we'll see! In the garden front, the watermelons and cucumbers have both decided to put out flowers. This is exciting news for us. I have visions of making pickles and eating fresh cucumbers in salads, on sandwiches, and seasoned with salt & pepper in the coming months. 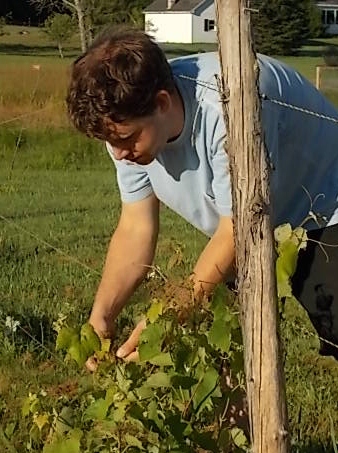 As Ryan mentioned in his post, Sean is waging a seemingly unending battle with the Japanese Beetles for the right to enjoy the grapes. So far, the beetles seem to be winning. While I put out some traps near the grape vines, Sean took matters into his own hands and literally picked almost a hundred of the buggers off of his vines. He was about as pleased as you can imagine about this. In response, we purchased a food grade, organic miracle cure for these in the form of acclaimed Diatomaceous Earth (DE). Be sure to get the food grade stuff, not the pool filter kind. It should be 98-99% pure, with the other 1-2% being some kind of trace mineral, also harmless. According to my research, this stuff is completely harmless to humans, but physically kills many pests, worm or insect in nature. You can rub a minute amount onto your animals' coats with no harm to them, but any fleas, mosquitoes, black flies or the like living on your livestock are destroyed because their protective coating is compromised to the point of their death. You can, also, mix DE into your pets' food without harm to anything except any unwanted worms living within them. I love the idea of a non-chemical way to fight problem insects organically, but all these claims seem too good to be true. We are trying it, since everything we have read about the use of DE has been resoundingly positive on the various forums and website I regularly read. As of now, I keep my opinion of the accuracy of these claims to myself, but if it works as well as promised, I will certainly report that. As a second line of defense, in conjunction with the DE, Tazmanian has graciously offered to stand guard over the grapes in case any hungry birds or curious squirrels attempt to full their bellies with them. Thanks for visiting with us tonight. Wow, that's a lot of chickens! I only have 13! We've been battling japanese beetles on our canna lillies. The leaves are full of holes and it's really frustrating. I use DE in the chicken coop, but didn't think to use it on the plants, so thanks for sharing the idea! You are welcome! Can you let me know if it works for you? Thanks again for the offer of chicks, but I am just not cut out for it. I will happily be a farm hand when I come to stay with you guys, but that will be the extent of my farming. I just get too attached to critters. Taz sure is a handsome kitter cat! No worries. You can come play farm-girl anytime, Miss Kimmy Jo. 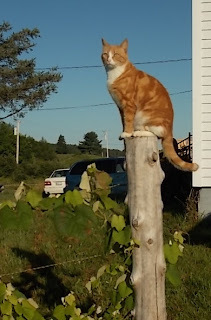 Our critters would LOVE you!